“A Winter’s Tale in Words and Song” exchanged “brrr” for brio in a crisp and comic performance by the Bach Aria Soloists and Heart of America Shakespeare Festival. This was their sixth collaboration, interspersing intimate chamber music with script-in-hand scenes from William Shakespeare’s catalog in a deftly balanced production at Johnson County Community College’s Polsky Theatre on Friday. 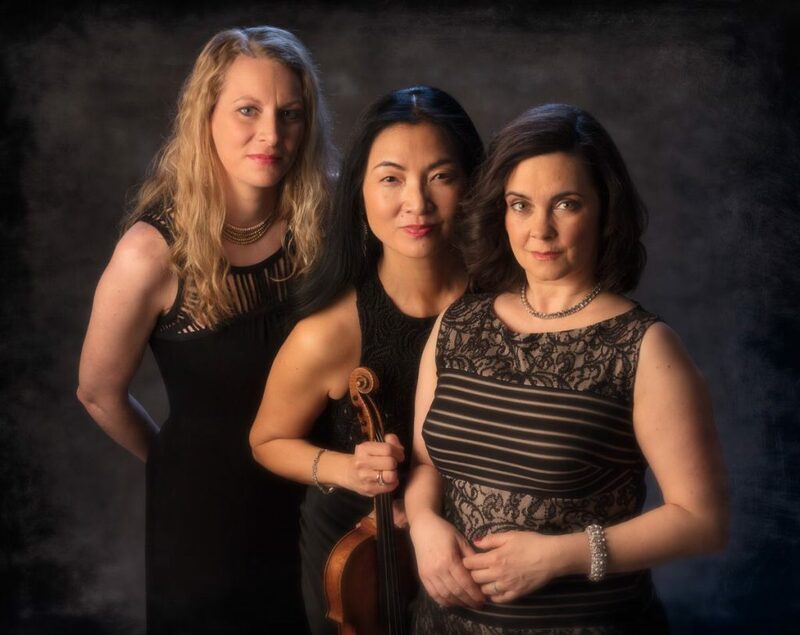 Bach Aria Soloists—Elizabeth Suh Lane on violin, Elisa Bickers on harpsichord, and soprano Sarah Tannehill Anderson—were joined by guest artist Michael Mermagen on cello. They established an emotionally centered role in the concert (and pragmatically center stage) with Claudio Monteverdi’s lovely duet “Pur ti Miro, Pur ti Godo” from “L’incoronazione di Poppea,” with Anderson as Poppea and Suh Lane fiddling Nero’s lines. Monteverdi was contemporaneous to Shakespeare, but the remainder of the program pulled from multiple eras, Baroque to modern day, each presented in a direct and refined manner. The actors, directed by Sidonie Garrett, turned this refinement kitty-cornered, though. Their modern, broad humored approach, starting with the balcony scene from “Romeo and Juliet,” made way for laughter often, even in some of the traditionally serious scenes. Jake Walker, as Romeo, startled individuals in the audience when he directed his rhetorical entreaties to them, causing flustered shrugs and ripples of chuckles. These were the first of many surprising down-to-earth touches that set the tone for the actors’ deliveries. Amy O’Connor, as Juliet (and later Beatrice and Miranda), was girlish and frank and delightful. Their interaction made me will for a full-length version of their story. Though most of the scenes took comic turns, Jan Rogge was a ferocious and manipulative Lady Macbeth, costumed in a dramatic robe (and the only performance sans script), with Matt Rapport as the complicit Macbeth. Rapport was also the drunken rascal Sir Toby Belch, from the somewhat-seasonal “Twelfth Night,” with Justin Barron cavorting as cohort Sir Andrew Aguecheek, brandishing a god-awful wig and bizarre accent, inspired by the character Fez from “That 70s Show,” in an unexpected yet effective take. Though most of the scenes were in duos and trios, the full cast participated in the mechanicals’ rehearsal from “A Midsummer Night’s Dream” and “The Winter’s Tale” scene, which included an abrupt and hilarious “Exit, pursued by a bear” moment by Rogge and Walker. The instrumental sections were more straightforward, but nevertheless offered surprises, too, such as Élizabeth Jacquet de la Guerre’s Sonata no. 1, with its intriguingly contrasting sections. Of course, it wouldn’t be a BAS concert without some Johann Sebastian Bach. This program featured Mermagen and Bickers on Bach’s Sonata No.1 in G major (originally for viola de gamba) and Anderson singing a lilting, melodious selection from the Christmas Oratorio. The only directly related-to-Shakespeare piece was Cecilia McDowall’s “First Rehearsal (Titania)” from her 2013 “Four Shakespeare Songs” with beautifully controlled singing and an interesting violin counterpart. Though not a holiday-centric presentation, they did offer a few nods to the season, with the traditional “Wexford Carol,” the arrangement creating a warm, velvety moment of hygge, Bickers in delicate relation to Anderson’s pristine delivery along with rich accompaniment from Suh Lane and Mermagen. In a natural choice, the program finished up with selections from Vivaldi’s “The Four Seasons,” the “Winter” movements, especially, moving from a wee flurry to a ferocious wind of Baroque élan, the ideal conclusion to a delightful program. Reviewed Friday December 7, 2018 at Johnson County Community College Polsky Hall, with an abbreviated performance December 8 at the Kansas City Public Library.